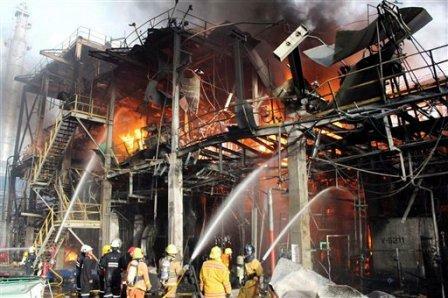 Associated Press (AP) reported that the explosions and a fire at one of the world's largest petrochemical industrial estates have killed 12 people and injured more than 100 others in eastern Thailand. The blasts Saturday forced the evacuation of more than 1,000 people living near Map Ta Phut industrial estate, Thailand's largest industrial park. The park is in Rayong province, 180 kilometers (110 miles) southeast of Bangkok. Rayong Gov. Seni Jittakasem says authorities are investigating the cause of the explosions, which occurred when workers were cleaning a chemical tank at a Bangkok Synthetics plant, a synthetic rubber manufacturer. He said Sunday all evacuees had returned home. Most of the dead were workers at the plant. The fire sent thick chemical smoke over a wide area. It was put under control after four hours.